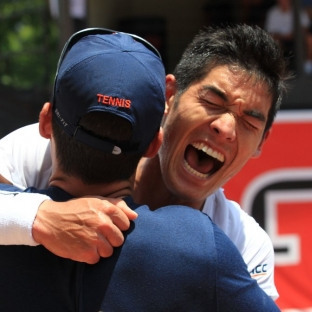 ATHENS, Ga. – Virginia men’s tennis senior Thai-Son Kwiatkowski was crowned the 2017 NCAA Men’s singles champion after defeating North Carolina’s William Blumberg 6-4, 7-6 (5) in the final on Monday at the Dan Magill Tennis Complex in Athens, Georgia. This is the fourth time a Cavalier has won the title with Kwiatkowski joining Somdev Devvarman (2007, 2008) and Ryan Shane (2015) as an NCAA singles champion. It also comes less than one week since Kwiatkowski helped lead the Cavaliers to the 2017 NCAA team championship. As an American player, Kwiatkowski’s championship also means he will earn an automatic bid into the main draw of the 2017 U.S. Open. The two players traded breaks in the first set, putting the scoring back on serve until Kwiatkowski broke Blumberg to go up 5-4 and then held serve to win the first set, 6-4. In the second set, both players again traded breaks in the middle of the set, but it finished in a 6-6 deadlock, forcing a tiebreaker. The two players battled back-and-forth to a 5-5 tie with Kwiatkowski winning the final two points to take the tiebreaker and win the match 6-4, 7-6 (5). This was the third time this season Blumberg, the ACC Freshman of the Year, Most Outstanding Player of the NCAA team tournament and the ITA National Rookie of the Year, and Kwiatkowski had faced one another. The two played one another last week in the final of the NCAA team championship with Blumberg winning 6-3, 6-2 as well as prevailing in the ACC Championship semifinals, while their meeting at ITA National Team Indoors was abandoned in the third set before completion. This was the third time Kwiatkowski played in the NCAA Singles tournament, but it was his first trip to the finals. Kwiatkowski ends his career having won an NCAA singles championship, three-straight NCAA team championships, including being named the MVP of the 2016 tournament, an ITA National Team Indoors title, three ACC Championships as well as winning the singles and doubles titles last season at the ITA All-American. He finishes his collegiate career with a 136-24 record in singles and a 95-21 mark in doubles.